Thundering down a Daytona straightaway, trading paint with Dale Earnhardt, Jr. and Kyle Busch, and frantically trying to hold your beat-up bucket of bolts together, you realize there%26rsquo;s a decision to be made. Half a lap to go until the finish %26ndash; do you nudge Junior out of the way and risk a black flag, cut Busch off on the inside, or just maintain your line and hope there are enough fumes in the tank and rubber on the tires to make it to the winner%26rsquo;s circle? Say what you will about NASCAR (insert clich%26eacute;d Southern redneck/left turn joke here), it can get pretty wild at times; the intensity of the last lap of a big-time race is undeniably taut. Where EA%26rsquo;s first big league racers on next-gen consoles didn%26rsquo;t quite deliver on that white-knuckle promise, NASCAR 09 is a fine-tuned house of horsepower. Sporting greasy-smooth visuals, solid online play, and gobs of opportunities to tinker with your rides, it%26rsquo;s a complete package of racing goodness. Newbies and veterans alike are welcome behind the wheel - a key element missing in so many of today%26rsquo;s ultra-complicated auto racing titles. There%26rsquo;s no shame in cranking NASCAR up, starting a career in the Craftsman Truck series on rookie mode, and learning the ropes. Unless you%26rsquo;re exceedingly well-schooled in the ins and outs of virtual stock cars, that%26rsquo;s the right place to begin. The higher difficulty levels exact a demanding toll of concentration and willpower, as well as a healthy modicum of self-discipline to hold off from smashing your way through a crowded field of vehicles that don%26rsquo;t take kindly to such ungentlemanly behavior. It%26rsquo;s a long way to the top from the trucks to the Sprint Cup. When you%26rsquo;re not knee-deep in the meaty career mode customizing your wheels, scoring sponsorships, and building your rep, you can head online with your own created dude or real-life racer to do battle. Unlike years past, online is a smooth proposition, with up to 14 maniacs at a time careening across the track - be prepared for a perilous and unforgiving multiplayer world out there. Cynics may knock a lack of innovation, but that%26rsquo;d be missing the point. This is NASCAR, after all, and until Tony Stewart and company start strapping laser sharks to their hoods or machine guns to their quarterpanels, there%26rsquo;s only so much that can be done. With that said, Tiburon didn%26rsquo;t do any skimping this season; each aspect of the game is tight as a drum. 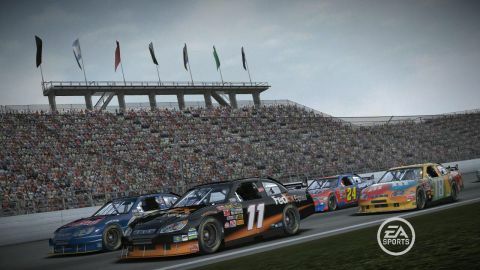 NASCAR 09 easily trumps its predecessors as the best of this generation. Description A sweet pick-up-and-play racer that burns rubber from the get-go, offering something for everyone with a penchant for RPMs and blatant commercialism.